"Scripture tells us that there is evil in the world, and that terrible things happen for reasons that defy human understanding. In the words of Job, "When I looked for light, then came darkness." Bad things happen, and we have to guard against simple explanations in the aftermath." The Prophet Ayyub (peace be upon him) was one of the descendants of the Prophet Ibrahim (peace be upon him) and a nephew of Prophet Ya'qub (peace be upon him). He was sent to reform the people who lived in the desert situated in the north eastern corner of Palestine. When Ayyub (Job) was chosen to be the Prophet, he started to teach the people about God and His religion. He advised the people to do good and shun evil. As usual with all the Prophets very few people believed in him in the beginning but gradually the number of his followers began to increase. ***It must repeated once more, that as far as the People of the Book were concerned, the Quran was the revelation for the pagan Arabs only and not for them since it is only an INAUTHENTIC COPY of their Torah and contained absolutely nothing new or equal to what they already had. What an "Obamanation" this was! Released by the White House, below are President Obama's remarks for his speech at the Arizona memorial. 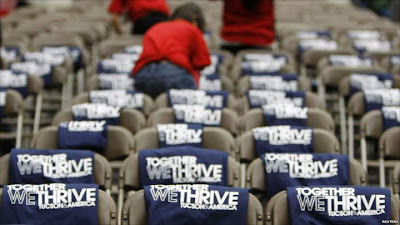 The speech was held at the McKale Memorial Center at the University of Arizona in Tucson. Obama began his remarks at 6:43 P.M. MST and concluded at 7:17 P.M. MST. George and Dorothy Morris -- "Dot" to her friends -- were high school sweethearts who got married and had two daughters. They did everything together -- traveling the open road in their RV, enjoying what their friends called a 50-year honeymoon. Saturday morning, they went by the Safeway to hear what their congresswoman had to say. When gunfire rang out, George, a former Marine, instinctively tried to shield his wife. (Applause.) Both were shot. Dot passed away. She showed an appreciation for life uncommon for a girl her age. She'd remind her mother, "We are so blessed. We have the best life." And she'd pay those blessings back by participating in a charity that helped children who were less fortunate. Our hearts are broken by their sudden passing. Our hearts are broken -- and yet, our hearts also have reason for fullness. Our hearts are full of hope and thanks for the 13 Americans who survived the shooting, including the congresswoman many of them went to see on Saturday. These men and women remind us that heroism is found not only on the fields of battle. They remind us that heroism does not require special training or physical strength. Heroism is here, in the hearts of so many of our fellow citizens, all around us, just waiting to be summoned -- as it was on Saturday morning. Their actions, their selflessness poses a challenge to each of us. It raises a question of what, beyond prayers and expressions of concern, is required of us going forward. How can we honor the fallen? How can we be true to their memory? You see, when a tragedy like this strikes, it is part of our nature to demand explanations -- to try and pose some order on the chaos and make sense out of that which seems senseless. Already we've seen a national conversation commence, not only about the motivations behind these killings, but about everything from the merits of gun safety laws to the adequacy of our mental health system. And much of this process, of debating what might be done to prevent such tragedies in the future, is an essential ingredient in our exercise of self-government. Scripture tells us that there is evil in the world, and that terrible things happen for reasons that defy human understanding. In the words of Job, "When I looked for light, then came darkness." Bad things happen, and we have to guard against simple explanations in the aftermath. For the truth is none of us can know exactly what triggered this vicious attack. None of us can know with any certainty what might have stopped these shots from being fired, or what thoughts lurked in the inner recesses of a violent man's mind. Yes, we have to examine all the facts behind this tragedy. We cannot and will not be passive in the face of such violence. We should be willing to challenge old assumptions in order to lessen the prospects of such violence in the future. (Applause.) But what we cannot do is use this tragedy as one more occasion to turn on each other. (Applause.) That we cannot do. (Applause.) That we cannot do. After all, that's what most of us do when we lose somebody in our family -- especially if the loss is unexpected. We're shaken out of our routines. We're forced to look inward. We reflect on the past: Did we spend enough time with an aging parent, we wonder. Did we express our gratitude for all the sacrifices that they made for us? Did we tell a spouse just how desperately we loved them, not just once in a while but every single day? We may ask ourselves if we've shown enough kindness and generosity and compassion to the people in our lives. Perhaps we question whether we're doing right by our children, or our community, whether our priorities are in order. And that process -- that process of reflection, of making sure we align our values with our actions -- that, I believe, is what a tragedy like this requires. And in Christina -- in Christina we see all of our children. So curious, so trusting, so energetic, so full of magic. So deserving of our love. And so deserving of our good example. If this tragedy prompts reflection and debate -- as it should -- let's make sure it's worthy of those we have lost. (Applause.) Let's make sure it's not on the usual plane of politics and point-scoring and pettiness that drifts away in the next news cycle. Imagine -- imagine for a moment, here was a young girl who was just becoming aware of our democracy; just beginning to understand the obligations of citizenship; just starting to glimpse the fact that some day she, too, might play a part in shaping her nation's future. She had been elected to her student council. She saw public service as something exciting and hopeful. She was off to meet her congresswoman, someone she was sure was good and important and might be a role model. She saw all this through the eyes of a child, undimmed by the cynicism or vitriol that we adults all too often just take for granted. As has already been mentioned, Christina was given to us on September 11th, 2001, one of 50 babies born that day to be pictured in a book called "Faces of Hope." On either side of her photo in that book were simple wishes for a child's life. "I hope you help those in need," read one. "I hope you know all the words to the National Anthem and sing it with your hand over your heart." (Applause.) "I hope you jump in rain puddles." If there are rain puddles in Heaven, Christina is jumping in them today. (Applause.) And here on this Earth -- here on this Earth, we place our hands over our hearts, and we commit ourselves as Americans to forging a country that is forever worthy of her gentle, happy spirit.